Pisgah Press LLC, 9781942016397, 250pp. A Freethinker's Gospel is a collection of columns by Chris Highland, first published in the Asheville Citizen-Times from 2016-17. A former Protestant minister and prison chaplain, Highland is now a secular "freethinker" who muses on the natural world, on being a non-believer in a highly religious society, and the commonalities shared between religions. This compilation of essays offers his reflections on interfaith work, the search for self-discovery, and the commonalities that bind us regardless of social, political, economic, or religious backgrounds. His insights about the marvelous structure of our natural world and what nature can teach us, and the way our society is structured, addressing humanism, the natural world, and sensitive issues of faith, are enlightening and challenging. Chris Highland was born and raised in the Pacific Northwest and lived for over 35 years in the San Francisco Bay Area. He was a Protestant minister and Interfaith chaplain for many years before becoming a Humanist celebrant. With a degree in Religion and Philosophy from an evangelical Christian university (Seattle Pacific) and a Master of Divinity degree from a diverse consortium of seminaries (Graduate Theological Union in Berkeley), he has been active in "presence ministry" and nonprofit work in a private school, a county jail, homeless shelters, and affordable housing. He is the author of ten books including Meditations of John Muir, My Address is a River, Life After Faith, the novella Jesus and John Muir, as well as an essay collection, Nature is Enough. He has taught courses on Nature Literature and Freethought in California and North Carolina. Chris blogs at Secular Chaplain. As a member of The Clergy Project, he contributes to Rational Doubt on Patheos. Seeking wider connections, he also holds membership in the American Humanist Association, Americans United for Separation of Church and State, the Religious Naturalist Association, and the Freedom from Religion Foundation. With a degree in Religion and Philosophy from an evangelical Christian university (Seattle Pacific) and a Master of Divinity degree from a diverse consortium of seminaries (Graduate Theological Union in Berkeley), he has been active in “presence ministry” and nonprofit work in a private school, a county jail, homeless shelters, and affordable housing. 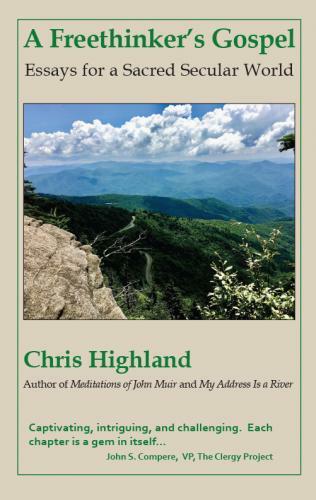 Since 2016 he has written weekly “Highland Views” columns for the Asheville Citizen-Times (a USA Today affiliate), addressing humanism, the natural world, and sensitive issues of faith. Previous books include his “Meditations” series of Henry David Thoreau (2002), Ralph Waldo Emerson (2004), Walt Whitman (2004), Margaret Fuller (2007), and John Burroughs (2007). Both soothing and stimulating, these very digestible “meditations” show how a secular writer can convey very timely and worthy messages without being quarrelsome. Kudos to Chris Highland for taking us down this pleasant path of wisdom and realism. How grateful I am [for] Chris Highland, a wise, compassionate guide who has blazed his own trail through the wilderness on the other side of faith. This seminal work by former minister/chaplain Chris Highland is captivating, intriguing, and challenging. Each chapter is a gem in itself, and together they make for a powerful book. I was particularly struck with [the] straight to the heart and straight to the point presentation.... [A] very nice mix of well crafted, substantive columns. What I love about this book is that it truly — and intentionally — honors questions, not answers. The essays are varied, inspiring, informative and creative. [It’s] a great companion for time alone, or for stimulating conversation with others. Chris Highland’s ... articles are delightful and stimulating excursions for anyone. His genuine interest in the thoughts of others, and his willingness to describe his own, reveals a well- grounded sensibility that seeks to bridge the gaps between people divided by their] beliefs or doubts.